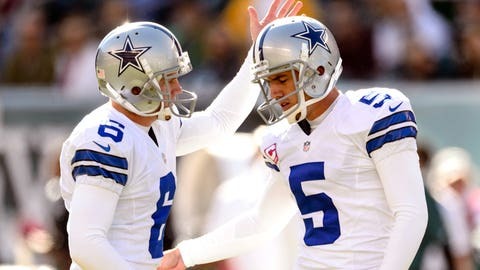 Cowboys kicker Dan Bailey (5) celebrates kicking a field goal with holder Chris Jones. The Dallas Cowboys have signed kicker Dan Bailey to a seven-year, $22.5 million contract through the 2020 season. Bailey, who originally signed with Dallas out of Oklahoma State after going undrafted in 2011, was set to be a restricted free agent. He gets a $4 million signing bonus and $7.5 million guaranteed. In three seasons with the Cowboys, Bailey has made 91 percent of his field goals (89 of 98) and all 123 extra-point attempts. He also has handled kickoffs. Bailey has already set a team record with eight career game-winning field goals. His career long is 53 yards, which he did twice in one game.